The 25 featured women will provide you with inspiration to keep you focused on your own empowerment path Rise In Pursuit of Empowerment. Written for and by inspirational entrepreneurial women whose hidden creativity and business acumen is eager to come out despite facing an array of traumatic experiences, mindset and domestic battles, RISE - In Pursuit of Empowerment, published by Reach for Greatness Ltd., is a beacon of hope for all women. Through the incredible stories of 25 women, you will learn that while obstacles are a given, you also have what it takes to rise above challenges, create a space and niche for yourself and turn impossible experiences into incredible opportunities that are profitable and fulfilling at the same time. Already hit #1 International Bestseller Status on Amazon within 24 hours. 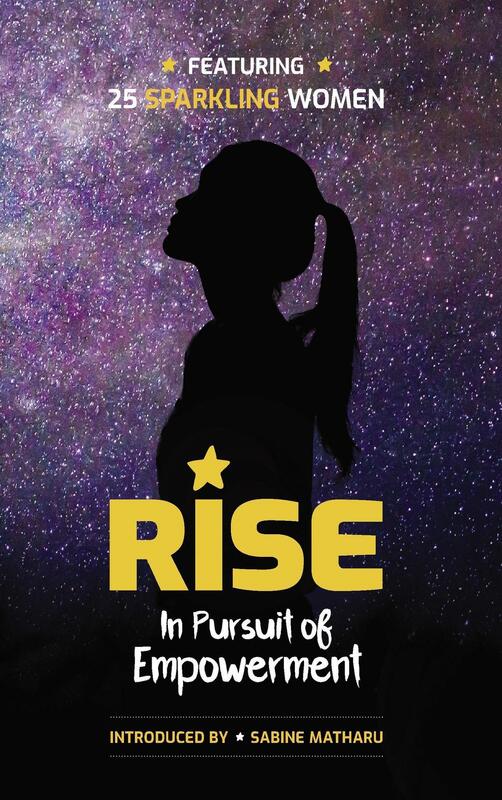 Rise - In Pursuit of Empowerment features 25 “sparkling” women entrepreneurs who have overcome adversity and are creating successful lives. The editors of the book choose a star-studded theme as you can see from the cover. Each of the 25 sections included an inspirational quote from the featured lady on a starry themed background, her success story, a professionally done photograph and a short blurb about her business. I had problems getting into the book initially. It seemed like there was an excess of sections before the main text. There was a dedication page, foreward, a section of reviews (which I always skip so as not to prejudice myself before reading), preface, a page mentioning where you can go to download bonus material and finally, the table of contents. Slow start aside, the stories these women shared were incredible. I enjoyed each and every one, whether or not I could relate to her struggles personally. I certainly felt inspired, which I believe was the intent of the book. Take Naomi for example. After living a cautious life because of a heart condition, she took up mountain climbing in her senior years. As if that weren’t enough, she became involved with the Mending 1000 Hearts charity organization committed to educating the people about operations that could significantly impact the lives of children born with congenital heart conditions. Then there was Sister Zeph. After dropping out of school following a beating and humiliation by a teacher, she began her own community school in rural Pakistan. She used her own earnings to buy school supplies for girls she taught in her courtyard under the open sky for 14 years. A windfall in the amount of $20,000 allowed her to buy a piece of property to build two rooms and a roof for her school. She now runs 2 schools with 200 registered students and offers training courses for more than 400 women each year. Many of the women featured became life or health or spiritual coaches as they worked through their struggles. Whether these women overcame health problems, prejudice, abuse, depression, the corporate glass ceiling, or obstacles of their own making, they have all found their calling by providing empowerment to other women. It only proves that “if you light a lamp for somebody, it will also brighten your path,” as said by Buddha. If you are in need of some inspiration to keep you focused on your own empowerment path, you will definitely enjoy Rise - In Pursuit of Empowerment. Born and raised in Austria, I was conditioned to go to school, work, marry and have children. This was considered a normal, well lived life of the average Austrian at the time I was being raised. However, for as long as I can remember, there was something intuitive telling me that I was born to do more. I was by nature, an adventurous child, who spent most days outdoors, playing in the woods and even sowing the seeds for entrepreneurship. One day during the summer holidays, I sparked off an idea to sell homemade stationary at the side of the road to by-passers. My arts and crafts skills were probably not up to scratch, and at the time I really didn't care. Looking back, it was a bit of fun, however the biggest lesson was that I allowed myself to be free and I truly 'went for it' without fear of failure or being judged. Fast forward a few years, I completed my university degree. Seeking out yet another adventure, I packed my bags and headed to the United Kingdom. With stars in my eyes, hope in my heart and joy in my bones, it felt like I was finally putting on my 'big girl' boots and taking on the world. With a good qualification in my hands and a thousand pounds in my pocket, I was sure that it wouldn’t take long for me to find a decent, well paying job. Thoughts of a bright future and visions of me prospering warmed my heart. The anticipation was wonderful, almost like being in love. With all these positive vibrations, what could possibly go wrong? As soon as I arrived, it was clear that my thousand pounds was not going to see me through. Settling for accommodation that was way below the standard I was accustomed to, a youth hostel where I lived with 18 others and a couple of rats, was the only option. I consoled myself with the thought that I would begin the job hunt immediately to be able to move on quickly. My bubble burst when I faced rejection repeatedly. To top it all, there were no friends or family to rely on to support me, hence I had to navigate my way around the city by myself. At this rate, the possibility of running out of money before finding a job was very high. Nonetheless, I persevered and told myself that going back to seek help from my parents was not an option. I wanted to show the world that I could master anything that life threw at me. My perseverance paid dividends. After finally finding a decent job through sheer determination, things were on the rise and falling into place, as I was introduced to my future husband through a work colleague. Building momentum and working my way up the corporate ladder, things couldn't have been any better, when I was offered my 'dream' position in management consulting. I was excited as I was travelling a lot to see clients, lived out of suitcases, and went from hotels to boardrooms and back to the airport again. During that time I was training hundreds of people, influencing their lives in positive ways and I absolutely loved it! There were many moments in my career and life, when I lived on an absolute high, believing that nothing could ever overpower those feelings. I was so wrong. Every woman will tell you that nothing compares and is more invincible than the feeling of becoming a mother. It changed my life completely. Whereas, I always felt that I would give birth and return to work after my maternity leave, I was least prepared for the overwhelming feeling that nothing was more important than my child and wanting to be there for him. Eventually I went back to work and soon got into the swing of things, at times feeling guilty for not being there for my son as he was just a little toddler. When I had my second child, those old feelings of wanting to be there for the both of them now, returned. Being used to creating new and exciting things, I took the plunge and used my skills to open my own business as a leadership and coaching consultant. A few years later, realising that there was a whole new world when it comes to expanding my business online, I ventured into yet a new arena that was initially overwhelming. Learning everything about starting and growing a business using the internet and social media, sadly my path consisted of many 'shiny objects', pitfalls and unnecessary detours. For me, this was the turning point. I remembered how playful and 'free spirited' I was as a child. So it dawned on me, that my mission was to create a platform for women entrepreneurs, to help them reduce the overwhelming challenges of starting and running a business, avoiding costly mistakes and detours. This is when I decided to launch “Reach for Greatness”. Within the space of 3 years, it has developed into a thriving platform that integrates "The Greatness Club" as well as an exclusive Mastermind, called "The Business Accelerator". Women learn to develop their entrepreneurial skill set and strategies to implement and run a successful business at various levels. My programmes also focus on creating a balance between business and personal growth, supported by collaborate opportunities to become more visible. This series of books was inspired by this vision. Whilst what I do in "Reach for Greatness" delivers transformational breakthroughs in business, it is also my desire to help others by being approachable, caring and compassionate. I believe, helping those that are less fortunate to become empowered, to create sustainable and balanced lives for themselves, is the greater part of my legacy and will live on even when I am no more.